Hitchens, deluded bigots, Gingrich, HalfMooner and more! 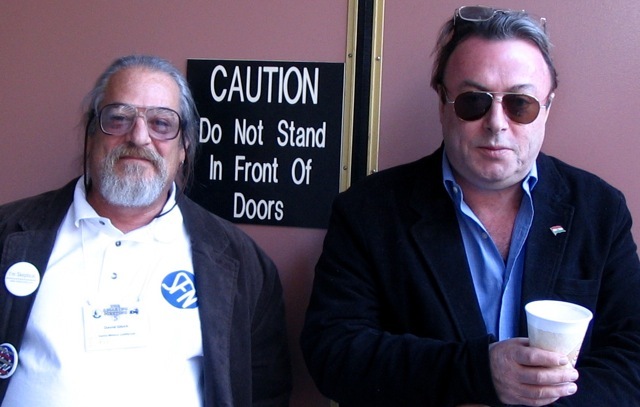 Christopher Hitchens has died - The loss felt by atheists and skeptics is huge. Cue the oh-so-persecuted delusionists - Rick Perry flaunts his bigotry for all to see. Gingrich and EMP - Blowing smoke does not a launch into space make. Editor’s Choice: Missing Mooner - SFN members voice concern over a staff member gone AWOL. Postscript: Christopher Hitchens, 1949-2011 — There has been much written about Christopher Hitchens’ passing in the last few days. And that’s as it should be. As an essayist, he had few equals. I have read many of the eulogies written about him, and I have picked my favorite, because a close friend of his, Christopher Buckley, wrote it. I hope that you’ll find it as insightful as I did. There is no doubt that Hitchens made some of us crazy, or angry, or sometimes inclined to stand up and cheer while reading his always-eloquent, bitingly witty prose. He made us think. And while I didn’t always agree with him, he dished out a very substantial helping of food for thought with every essay and book that he wrote. On a more personal note, I had the pleasure of meeting Christopher Hitchens at TAM5. One of the benefits of smoking (and there’s no need to tell you that there aren’t very many) is getting to meet other smokers hanging out in a designated area, grabbing a smoke. I have met several people at various TAMs that way. And while I don’t recommend it as a reason to smoke, it does have its advantages. It’s the socially unacceptable habit that brings us together and forms a kind of camaraderie of fellow travelers, who at least in one area of our lives as skeptics, are cognizant of our cognitive dissonance with regard to the evils of smoking, and run with it, even as we cough up all sorts of terrible things. We are a dying breed. The deed was done. I thanked Mr. Hitchens and he went back to whatever the conversation was that he was having before I intruded. Later that evening, well after his talk and his panel discussion (complete with one of his trademark “Hitchslaps”), I saw him holding court on the balcony outside of the over crowded room that resembled the state room scene in the Marx Brothers movie, A Night at the Opera. That was at the Skepchick party. He was out there with the other smokers. He saw me and gave me a slight nod. Why? I have no idea. Perhaps it was in my imagination that he did that. I don’t know. But it was too cold out there for me. I took a puff, put out my cigarette and went back inside. And that was that. Most TAM speakers are quite willing to hobnob with the riffraff. Their fans. And Hitchens was no exception. But of all of my fan photos, only Hitchens took the extra time to make it something very special. He was a cool guy. Wednesday: We started out with crude analogies between the electronics industry and medicine. There are a lot of fish in the sea, and though most of us agreed the best-looking ones are younger, marriage prevents some of us from going fishing. From there, by association, we slipped into talking about fish for holiday dinners. Salmon, tuna, cod or herring… canned, cooked, fried, raw, pickled or fermented/rotten. Talk about fishing also led to out-fishing natural resources and over-exploitation of nature in general. Then celebrities who don’t seem to think that rules, any rules, apply to them. The chat ended with some sober thoughts on the mortality of man and animals. The Higgs boson: What has God got to do with it? Arguably: Essays by Christopher Hitchens, by Christopher Hitchens. “‘All first-rate criticism first defines what we are confronting,’ the late, great jazz critic Whitney Balliett once wrote. By that measure, the essays of Christopher Hitchens are in the first tier. For nearly four decades, Hitchens has been telling us, in pitch-perfect prose, what we confront when we grapple with first principles — the principles of reason and tolerance and skepticism that define and inform the foundations of our civilization — principles that, to endure, must be defended anew by every generation. ‘A short list of the greatest living conversationalists in English,’ said The Economist, ‘would probably have to include Christopher Hitchens, Sir Patrick Leigh-Fermor, and Sir Tom Stoppard. Great brilliance, fantastic powers of recall, and quick wit are clearly valuable in sustaining conversation at these cosmic levels. Charm may be helpful, too.’ Hitchens — who staunchly declines all offers of knighthood — hereby invites you to take a seat at a democratic conversation, to be engaged, and to be reasoned with. His knowledge is formidable, an encyclopedic treasure, and yet one has the feeling, reading him, of hearing a person thinking out loud, following the inexorable logic of his thought, wherever it might lead, unafraid to expose fraudulence, denounce injustice, and excoriate hypocrisy. Legions of readers, admirers and detractors alike, have learned to read Hitchens with something approaching awe at his felicity of language, the oxygen in every sentence, the enviable wit and his readiness, even eagerness, to fight a foe or mount the ramparts. Here, he supplies fresh perceptions of such figures as varied as Charles Dickens, Karl Marx, Rebecca West, George Orwell, J.G. Ballard, and Philip Larkin are matched in brilliance by his pungent discussions and intrepid observations, gathered from a lifetime of traveling and reporting from such destinations as Iran, China, and Pakistan. There were 6,593 daily visitors this week.